G37 Coupe | What Car? So far, so sporty, but BMW also does a handy line in sporty coupes, so the two-door G37 has its work cut out. It's pretty good. Sling it down a road with more corners than straights and it proves pretty well balanced. It's nimble, too, shifting its not-insignificant weight around like a slightly porky ballet dancer. The steering's pretty talkative, while the strong brakes and howling exhaust note make the two-door car great fun down a twisty section of road. 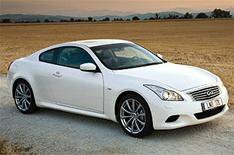 Top-end G37S models also have a limited-slip differential and four-wheel steering for added bite. Don't think the G37 Coupe is all about getting from over here to over there via the twistiest route possible, though. It's capable on the motorway, too, where a composed ride and low noise levels make long-distance cruising a comfortable affair. Obviously, you don't buy a coupe if you carry four passengers five days a week, but nonetheless it's good if you can get a couple of friends in there occasionally. In the G37 you can, although they'll have to stoop their head forward to avoid the rear windscreen if they're close to six foot. Even passengers who are a little shorter than this could still bang their head whenever the car goes over a bump. Unfortunately, the BMW 3 Series Coupe does everything the Infiniti does, but just a bit better.